O'Ryans Village Candy Blog: Review: Black Cow is Back! Over the past 50 years the candy companies have introduced new candy, discontinued others, and in some cases brought back the discontinued brands. They got it all figured out, right. Some companies insist they know best which candies to produce, while others listen to their customers and decide based upon their customer's feedback which ones to produce. In some instances, a company will drop a brand that is a favorite of consumers due to production difficulties or what they consider low volume. Tens of thousands of a brand may be purchased by consumers, yet the manufacturer will consider it low volume and discontinue the item. This item either goes away forever, or in recent years, new companies emerge and feel it worthwhile to produce and distribute the item. So, it's all about business, not really about what you and I like. One such manufacturer is Classic Caramels. They have bought up the rights to a number of old time candies and reincarnated them. They seem to be reinventing the recipes to match their production styles. Most times the new product is not as we remember it. Sometimes it's pretty close, other times, not so close. They bought and reintroduced the Flipsticks candy several years ago. Flipsticks were one of my favorites as a kid because of the unique texture and flavor. The new product is a weak flavored stick of hard taffy. Still a good taffy, just not the same. 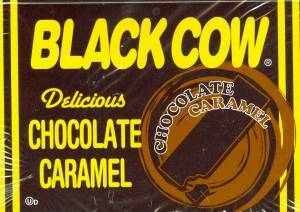 The Original Black Cow was basically a chocolate Slo-Poke. Stiff chocolate caramel on a sucker stick. They were great and stuck like crazy glue to your teeth. The new Black Cow is different in many ways. This great old classic has been resurrected into an honest to goodness instant classic. The taste like many redo's is different. It is a richer chocolate, blended into a soft taffy like texture.I guess you could call it a caramel too. Taffy or caramel, it's hard to pinpoint it. You be the judge. Not the original, but in my opinion, almost better. If I tried eating an original Black Cow at my current age, I would lose my teeth to it. The new Black Cow is pleasant to bite or twist off a hunk and let it melt in your mouth. And the flavor goes all the way through. Along with the improved flavor and texture of the modern version comes better packaging too. The stick is gone, and for good reason. This allows Classic Caramels to package the entire contents in a slick sealed foil wrapper instead of waxed paper wrapped around the bottom of the candy. We all know air kills food. The new packaging doesn't allow this to happen. You can still freeze it and crack it if you desire. The foil wrapper actually makes this method of consumption quite convenient. Freeze it, crack it, tear it open and eat it right from the package. In conclusion, although Black Cow has changed from the original classic candy, it is very much made in the old fashion style complimented by modern techniques. It's a win win proposition. So check out the new Black Cow, I doubt you'll be disappointed. Check into our Facebook page too. We've been known to give this and other great old time candies away to our friends just for playing our Tuesday trivia, answering silly surveys, or giving us your feedback.